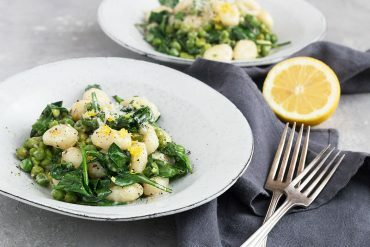 A delicious, one-pan pasta, this quick and easy Lemon Spinach Pasta uses a no-cook sauce so it’s easy and ready in just the time it takes to boil pasta! I love lemon pasta and I happily eat it year round. 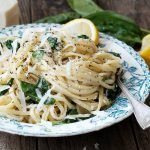 This Quick and Easy Lemon Spinach Pasta is one of my favourite lemon pasta recipes. It’s a great way to use up Crème Fraîche, and it’s always a bonus that it’s ready in just the time it takes to boil the pasta. The speedy secret of this pasta is that it uses a no-cook sauce. Even the spinach requires no cooking. 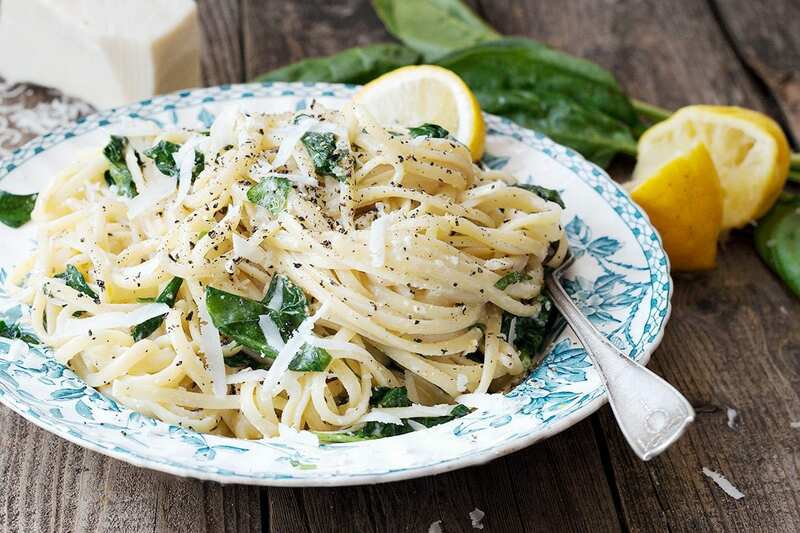 Simply combine the sauce ingredients and the raw spinach with hot pasta, toss and enjoy. The heat of the pasta does all the work for you. And this pasta has another secret to making it delicious. Adding a whole lemon to the pasta water while it comes to a boil, infuses some of the lemon flavour right in to the pasta. When the whole lemon is removed before adding the pasta, let it cool, then juice it for the sauce. You’ll be amazed at home much juice comes out of it! Make Your Own Crème Fraîche at Home: Simply combine 1 cup heavy, whipping cream with 2 Tbsp buttermilk in a jar. Cover loosely and let stand on your counter for 8-24 hours, until thickened. You could do this in the morning and have it ready to enjoy by dinner time! 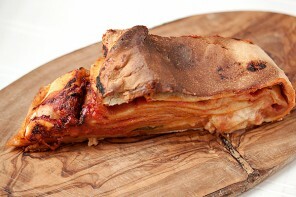 You could also substitute mascarpone cheese, if you have that on hand. Beyond that, you’re getting in to territory that’s not quite as reliable to maintain the flavour and creaminess of this dish. You could use whole fat Greek yogurt. 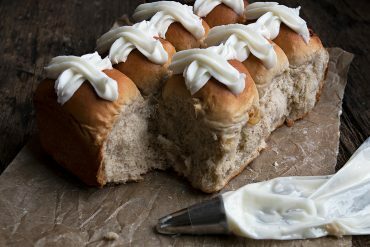 You could use heavy cream mixed with a bit of buttermilk or sour cream (for a bit of tangy). As for the spinach, go with baby spinach or small, fresh spinach leaves roughly chopped, to ensure it wilts well with just the heat of the pasta. Have arugula? Go ahead and use that instead of the spinach. I love fresh basil in this dish, but you could easily omit without a major flavour hit to this dish, if you don’t have any on hand. If you’re anything like me, you always struggle with how much dried pasta to use. Follow the simple rule of thumb below to get it right, every time! How much dried pasta for 1 serving? For long, dried pasta, such as spaghetti, spaghettini, linguine, angel hair etc, the rule of thumb is a 1-inch diameter circle of dried pasta per serving. This is perfect for an average serving. If you have a hearty appetite, bump it up to 1 1/2 inches. Quick, easy and delicious, this pasta is one-pan easy , uses a no-cook sauce and ready in the time it takes to cook the pasta! Fill large pot with water and add the whole lemon to the water. Remove zest from about 1/2 of the whole lemon and set the zest aside for the sauce. Add zested whole lemon to the water and bring the water with the lemon to a boil over high heat. Once boiling remove lemon and set aside to cool. Add salt to your water, then add pasta and cook to al dente according to package directions. Meanwhile, stir together the sauce ingredients in a small bowl. Prepare your spinach and set aside. When lemon is cool enough to handle, cut in half and juice. Pour juice through a strainer in to a small bowl, to remove seeds and pulp. Set aside. When pasta is cooked, before draining, remove 1 cup of the pasta water and set aside. Drain pasta well and return to the pot. Add sauce mixture and spinach to the pot with the hot pasta and with tongs, toss well until the spinach is wilted and sauce is coating the pasta. 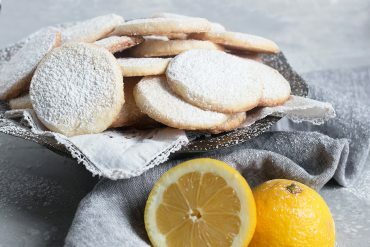 Drizzle with reserved lemon juice and toss well. If pasta seems tight (clumpy/sticking together), add a bit of your reserved pasta water to the pasta and toss to loosen it up. Season with salt and freshly ground pepper, to taste. Serve with additional freshly grated Parmesan and more freshly ground pepper. To measure dried linguine or other long, dried pasta for 2 servings, aim for a 2 -inch diameter circle of dried pasta for an average serving or up to 3-inches for a hearty appetite. 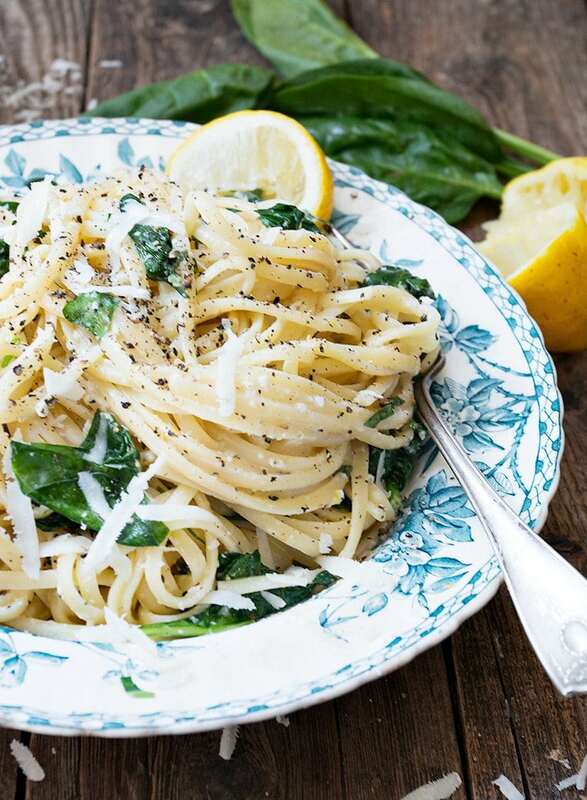 The best lemon spinach pasta ever!!! 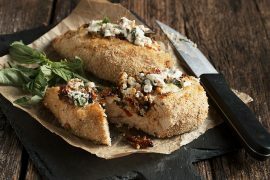 I can’t tolerate much garlic and onion, so finding a great recipe like this without any garlic or onion is very exciting for me. 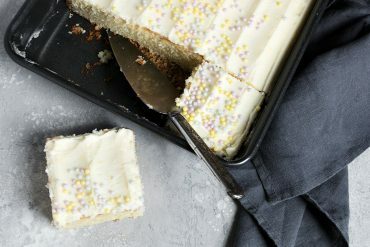 I used the creme fraiche; I’ll be making this every week! 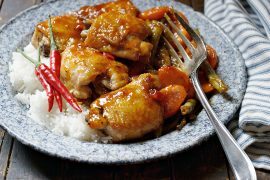 Another great recipe – this turned out very well, and really is quick and easy. 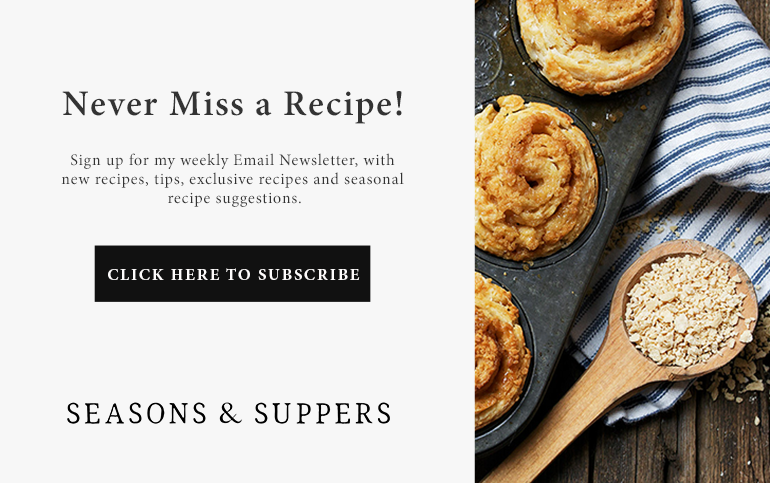 Love the blog but not sure why the ads are now popping up in front of the recipe steps preventing me from reading the full recipe? Just did some experimenting Sue and I could duplicate that in a mid-screen size (maybe you’re using an iPad?). I’ve emailed my ad provider to get that fixed. Thanks for the heads up! Yes it’s on an iPad. (I can no longer cook without an iPad it seems. 😂 ) Thanks for looking into it! No problem :) They should have it fixed soon. And I can’t cook without my iPhone, so I definitely get it. Made this awhile back & am just getting around to commenting! The dish was so easy to prepare and was outstanding! The lemon used in the water yielded plenty of juice. Substituted full fat Greek yogourt for the creme fraiche. Thanks Dawn and yes, great Friday night food! This looks so delicious, the perfect weeknight pasta! 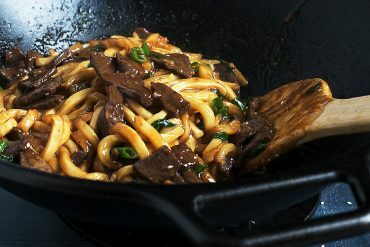 One-pan pasta with a no-cook sauce? That has a nice ring to it! I’m in!! I agree! I love the fact that this one comes together in one pot! I love adding spinach to dishes like this. No cook, no fuss, just perfect! I also love your tip about adding a whole lemon to the pasta water. I cannot wait to try this lovely recipe. 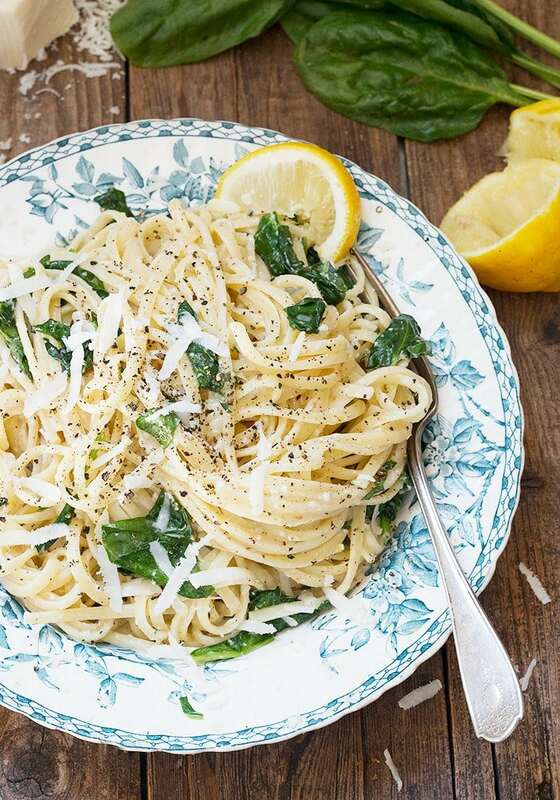 We love our pasta, and lemon and spinach too! Sharing and pinning. I need some quick and easy dishes just like this lately! Seems like I’m always scrambling last minute at dinner time. On my list Jennifer! Happy weekend! Thanks Mary Ann and happy weekend to you, too! Hi Jennifer. I’ve been making a very similar recipe for years and can attest to the fact that the combination of lemon, spinach, & pasta is simply divine. The addition of coarse ground pepper is the perfect finishing touch! You’ve inspired me to cook this up again soon, as it’s yummy and healthy too!